Civilians capture Yavneh terrorist, victim fights for his life. A new video shows footage of civilians holding the terrorist to the floor and searching him for the knife. Later, police arrive and handcuff the suspect. In the video, civilians can be heard calling, "Where's the knife? Where's the knife? Where's the knife you, son of a wh***?" and "Did you call an ambulance?" 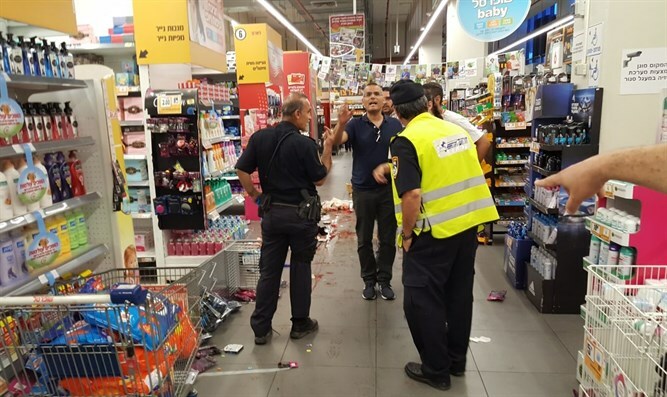 The terrorist stabbed a 43-year-old man at a supermarket in the central city of Yavneh on Wednesday morning, just before noon. Police say the incident was a terror attack. United Hatzalah EMT Netanel Moyal said, "While I was at work near the location of the incident the United Hatzalah dispatch and command center alerted me to the incident which took place at the Sufersal supermarket." "I rushed over to the scene and treated the individual suffering from stab wounds to his upper body. While I was treating him other volunteer EMS personnel joined me and he was taken by ambulance to Kaplan medical center in Rehovot." A number of people were also treated for shock following the incident. The victim is in critical, life-threatening condition, Kaplan Hospital's emergency room staff reported, noting that he is fighting for his life.